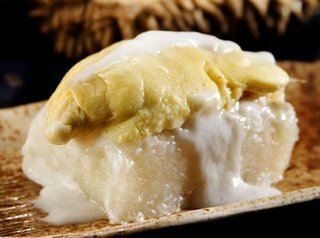 Durian is the smelly fruit that originate from Borneo, and the name Durian is believe from Malaysian meaning spines, because of the spikes on the outer fruit. It's the most expensive, and the most sought after fruit in Asia. You can find durian plantations in one of Thailand. Although it's a dessert recipe, this is very filling and could be served as a main course. Sweet sticky Rice with durian is optional. It’s easy for Thai vegetarian cooking. This menu is use for period Kin Jay festival. - 2 cups un-cook jasmine sweet rice. Rinse. - 1 large can of coconut milk. - 1/2 lb or 1 piece frozen, seedless "Fresh Durian" pulp. Thaw. 1. Cook sweet-rice with one-cup water and vanilla extract in the rice cooker. 2. When sweet-rice cooked. Separate rice with spatula. Place in a large bowl and set a side. 3. While the sweet rice cooking. Pour coconut milk in a cooking pot and cook over medium heat. Simmering till the sauces reduce. 5. Immediately pour the sauce over cooked sweet rice. Mix well. 6. Serve either warm or cool. Enjoy eating your cooking for Thai recipes vegetarian food.